I found another product that struck me as being similar to what we are working on. 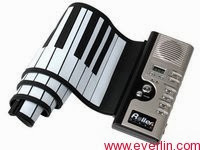 It's a roll up piano from http://www.everlin.com/sample/product.php?lang=en&class1=107 . That can be seen in action here http://www.youtube.com/watch?v=ZToh-rhoFy4 . The cool thing I see about this device is that it has midi output. The bad thing is that I think it has no velocity sensitivity and also has no touch sensitivity in the Y plane. But I was just wondering if this company might be someone to ask if they might want to be involved in the development of our tactilemusic-pad. It would be cool if we could just modify this in some manner to make it become what we wanted. The other cool thing is that this device is only $34. This just goes to show what can be done with just a small amount of money. And I'm not asking for a device that can even creates sound at all just midi or usb data out is all we want, at least for now. But if it cost just $34 more it might be cool to add the feature of having totally portable rool up tactilemusic-pad that includes sound output like this at sometime in the future or maybe even in the first one to make a total portable device.